In August, Kilian Hennessy will be adding a seventh fragrance to his collection, Prelude to Love/ Invitation, composed by Calice Becker, her fifth for the brand. On skin, the hesperidic top notes disappear much more quickly, and the cardboard smell morphs into iris, twice quoted in the notes (as iris of Florence and iris notes). On a Russian leather base, stronger than on the scent strip, a damp-earth, musty smell (cypriol) emphasizes the rooty facet of the iris. Orange blossom and neroli come out distinctly after a few hours, outlasting the other notes. Lavender (actually the French “lavandin”, which grows at a lower altitude than real lavender), freesia, cardamom, pink pepper and muscs are also listed. It would be unfair to judge the fragrance from a single, mid-afternoon skin test (I prefer to do mine with a “clean” nose in the morning), but the first impression of Prelude to Love is of a quite lovely, non-austere iris, more discreet and delicate than the other fragrances of the line. Which kind of makes sense, for a prelude. 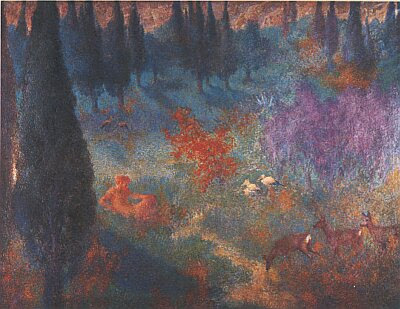 Image : L'après-midi d'un faune by Lucien Lévy-Dhurmer (1865-1953). Oh lord, a new iris to covet. I tried the new Prada for men today and realized how horrible synthetic iris can be (especially when compared with my HG, Iris Silver Mist). I love that Kilian actually lists the ingredients and amounts--it somehow gives me confidence that they are quality, but then again, who knows how accurate the list is. another costly tuberose, another gourmand etc. easily be found online for less than 20 bucks smells so 80's ok but to me it 's far more interesting than an average $225.00 niche fragrance so I 'll approach this with a certain skepticism but I promise to do my best to be open-minded. Billy, yes, a new iris... It's not an iris scent per se (lots going on in there) but what there is smells pretty good. Unlike you, I have problems with wearing iris though I find it a beautiful note, but this one seems to strike it just right for me. Emmanuella, I don't find By Kilian particularly groundbreaking either, but I appreciate the quality of the compositions. The tuberose is distinctive enough to warrant a bottle for tuberose lovers like me -- though at that price, I haven't bought it yet. And this citrusy-leathery iris really deserves testing. I agree with billy d, I adore the ingredient listing. It drives home that perfumery is an art of structure and proportion and not just piling on expensive ingredients. A herspedic citrus that fades to a cardboard iris rhizome sounds divine. What you describe sounds so light and composed in contrast to the jet black bottles. Is there any chance they are launching a new line? It's the same line, but I guess they've decided they needed something a little more delicate. Although that citrus opening packs quite a wallop.